Our staff and doctors are very caring and passionate about what we do. With years of experience, it is our priority to provide quality and affordable dental care for your entire family. We offer FREE Exam & Digital X-rays for all new patients and have some of the best reviews on Yelp and Google. 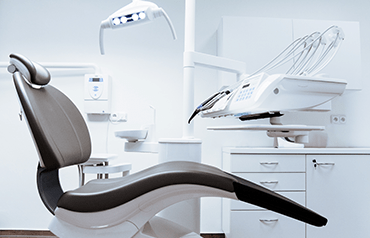 We pride ourselves in providing comprehensive dental care, including family dentistry, cosmetic dentistry, implant dentistry, general dentistry, and emergency dentistry. Our goal has always been to treat everyone as if they are part of our family. We believe in being honest, straight forward, and make it our priority to care for our patient’s needs. 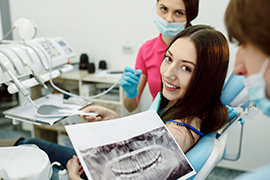 By offering free exam and digital x-rays, we want you to feel comfortable to come and see a dentist for a new exam or even for a second opinion. Our friendly staff will do their best to make sure you are comfortable. Our doctors will go over your concerns, evaluate your x-rays, examine your teeth and gums, and then try to educate you on what is best for you. Our job is to give you all the information you need so that you can make the best decision possible regarding your dental care. If desired, we offer in-house payment plans and other financing options such as care credit. Our doctors are very gentle and caring. They are graduates of UCLA and USC. Our doctors are experienced in all aspects of dentistry, including; Dental implants, veneers, porcelain crowns, white fillings, emergency dental visits, root canals, composite fillings, dental extractions, wisdom teeth removal, sedation for dental procedures, dentures, sport guards, night guards, zoom teeth whitening, Invisalign, conventional braces, dental bridges, and much more. We Provide Comprehensive Dental Care to The Los Angeles and South Bay Communities. Washington Dental is a full-service dental office providing quality and affordable dental care. Let us be the reason you smile! Regular dental exams every 4-6 months help us catch problems in the early stages and prevent others from ever beginning at all. We will spend your first visit checking your teeth for any signs of decay or weakening, and examine your gums to make sure they are healthy. Dental implants are the best choice when it comes to replacing a broken or missing tooth. Dental implants are fixed and permanent. We design our implants and its crown to match the color and contours of your other teeth. There is no other alternative when it comes to replacing a tooth. Washington Dental is a full service provider of quality dental care in the Los Angeles and South Bay regions of California. We have locations in Carson, Lomita, and Downtown L.A. and serve the entire metro area with a combination of up to date dental techniques and an "old fashioned" commitment to delivering the highest quality of care to each and every patient we serve. We offer a wide array of dental discounts, financing and payment options to get you the care you need right away. No interest and extended terms available. We accept most major dental insurance plans. We accept most major credit cards. 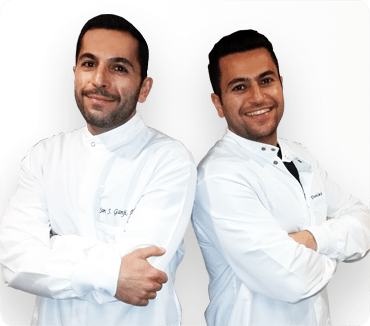 At Washington Dental, we have two fully trained, on-staff dentists: Doctor David Ganji and Doctor Sam Ganji. Both graduated with high honors from top U.S. dental schools. David Ganji earned his DDS (Doctor of Dental Surgery) degree from the University of Southern California, while Sam Ganji earned a DDS (Doctor of Dental Medicine) degree from the University of Pennsylvania School of Dental Medicine. Both of our dentists have deep real-world experience across a wide range of dental practice areas and continually keep themselves up to date with the latest developments in dentistry by participating in ongoing educational programs. We also have skilled, state-board-approved dental assistants with all the necessary educational background and experience to help make your experience in our office as pleasant as possible. And if you have any questions or need for help, we make excellence in customer service a top priority. Any member of our friendly, helpful staff will be happy to assist you. Washington Dental strives to be your number one choice of a permanent, local dental office in the Los Angeles Area. We work every day to earn your trust and to better your oral health in a multitude of different ways. "What we do," in the broadest possible sense, is to partner with you in caring for your mouth (both teeth and gums) to keep them healthy and strong for as long as possible as you go through life. We provide a single, convenient location to which you can resort for all of your dental needs without having to wonder about the quality of care you will receive. We know how difficult it can be to find the right dentist and yet how important it is to do so, and therefore, we commit ourselves to being that "right dentist" to all of our patients. How do we help you maintain optimal oral health? The answer to that question could be long and complex, detailing all of our individual services (and we will cover our services in broad strokes just below). But, in more general terms, we help by providing preventative, diagnostic, restorative, and cosmetic care to counteract dental and periodontal (gum-related) problems and diseases of all descriptions. I found Dr. Sam and David Ganji online and have been thoroughly impressed ever since. Their friendly attitude, attention to detail, and professional service easily make them my favorite dentists. In fact, my whole family loves them, including my children! The Ganji brothers are seriously in the Top 3 best dentists of Los Angeles. They never seem to be in a rush and listen to every one of your questions and concerns – guiding you the whole way. "Honest Dentists" are the best way to describe them. Love all their staff, very polite and welcoming. Their services are great, x-rays are so quick. My favorite part is I have no more old metal fillings. The Doctors have a great practice in DTLA. I couldn't thank Dr. Sam and David Ganji enough. As someone who is afraid of the dentist, I am glad to have finally found a pair of dentists who actually know how to make you feel comfortable. Thank you so much! All of our services at Washington Dental can be summed up as aimed at promoting the health, functionality, and aesthetic appearance of your smile. This leads us to offer a wide array of dental procedures, using only the highest quality tools, materials, and dental appliances. Below, we cover three major areas of our services and then put a special focus on dental implants, which many dentists do not offer and we have extensive experience at installing. Regular dental exams every 4-6 months help us catch problems in the early stages and prevent others from ever beginning at all. We will spend your first visit checking your teeth for any signs of decay or weakening, and examine your gums to make sure they are healthy. We will do our best to go over your dental health and what ever care you may require. We will explain everything step by step so that you can make the best decision possible. We use modern digital X-rays that instantly produce highquality images on an LCD monitor both you and your dentist can view. These hightech X-rays are both exceptionally detailed and produce as much as 90% less radiation. We also use intraoral minicameras to photograph your teeth to show you exactly what is happening to your teeth and gums if there is a problem. If we (or you) discover any cavities in your teeth, we can fill them in with natural-colored "white" resin fillings. The resin is strong, durable, stain-resistant, and minimizes the amount of tooth material that must be removed (as compared with silver, amalgam fillings). Tooth-colored or metal fillings, after removal of decayed tooth material. White resin fillings, which blend in with your natural tooth enamel and yet are still strong, durable, and stain resistant, are often used on front teeth. 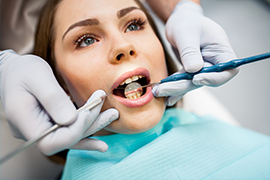 On back teeth, gold or silver amalgam fillings are often chosen for their added strength and because the filling is too far back in the mouth to be easily seen. Bridges and dentures of various types. We can provide you with dentures both partial/full, both removable/fixed. We offer Maryland, cantilever, and traditional bridges. Our dentists can help you decide on whether a bridge, denture, or dental implant is right for you. Crowns, including porcelain, metal, porcelain fused to metal, composite resin, and ceramic materials. Whether capping a root canal tooth, a cracked/badly damaged tooth, or a dental implant rod, we can help you select the best crown for your situation and install it securely. Root canals, which are a way to avoid an extraction and extend the use of your natural tooth, even after its internal pulp has become badly infected. The top of your tooth will be removed, the infected pulp removed, and the tooth cavity filled with guttapercha. The tooth will then be shaved down to receive the crown, which will be firmly attached with dental cement. Cosmetic dentistry, such as teeth whitening to remove long-clinging stains; bonding, which applies composite, tooth-colored resins to cover tooth imperfections/discolorations; and veneers, which are ultra-thin, enamel-colored shells that cover over larger imperfections and can also reduce over-sized interdental gaps. As a "family dentist," Washington Dental offers comprehensive care for every age group and services that cater to the needs of every member of the family. We also help busy families with features like same-day appointments, flexible scheduling, affordable pricing, acceptance of numerous forms of dental insurance, and in-house financing with 0% interest and manageable payment plans. Families benefit greatly from our full-treatment, high-tech dental exams. We not only clean your teeth to remove cavity-causing plaque deposits but also thoroughly check your teeth and gums for any signs of decay, weakening, or periodontal disease. We can use either laser or traditional tooth-cleaning methods, as you prefer, and we will take digital dental X-rays if necessary. Digital X-rays use 90% less radiation than earlier, film-based methods, and you can watch the results on-screen next to your dental chair. They are also faster and much more detailed than were the dental X-rays of the past. Many children growing up (and some adults) have need of orthodontic care, primarily braces, to correct tooth misalignments. We also fully handle braces, both traditional metal/ceramic braces and Invisalign "invisible" braces. In certain severe cases and with children not yet teenagers, metal/ceramic braces may be the only viable option. However, in most cases, Invisalign clear acrylic aligner trays can be used. Invisalign trays make it hard for others to even know you are wearing braces. They are also removable, which allows you to enjoy your favorite foods/drinks and engage in contact sports/strenuous exercise during treatment. Far fewer dental appointments are needed with Invisalign, and the treatment period is often shorter. However, those who dislike having to remove the acrylic trays before each meal may prefer metal braces. We can explain to you the pros and cons of each option and let you make an informed decision you will be happy with. At Washington Dental, we understand that all dental appointments cannot be planned out weeks or even days in advance. Sometimes, a dental emergency strikes and demands immediate attention. That is why we provide 24/7 emergency care for our patients and give priority to treating emergency cases. Dental emergencies include such things as cracked/broken teeth, an unbearably painful tooth ache that won't go away, and a tooth or dental appliance being knocked out. In such cases, do not hesitate to call us or even to just walk into our office to receive the help you need in a timely manner. Dental implants are the best way to replace a missing or broken tooth. Dental implants are fixed, durable and look very natural. They are the standard of care when it comes to tooth replacement and are very easy and safe to place. There are three parts to a complete dental implant, the dental implant itself, the abutment and the crown. Some people refer to the dental implant as a “post.” Every tooth has a part of it that is inside the bone, called the root, and the part that is visible above the gum is called the crown. The dental implant itself is placed into the bone just like the root of a tooth. Once placed inside the bone, the dental implant is left alone to heal for four to six months. This is the amount of time needed for the implant to integrate into the bone, which is called osseointegration. After the implant fully heals, the abutment is screwed into the implant. The crown is then permanently cemented on top of the abutment. You will be able to eat and smile confidently, because the implant is very strong and crown stays in firmly. If you haven't seen the dentist in some time and are in need of an emergency dentist, don't be worried. Call us anytime to schedule for a free exam & digital x-rays. Whether your tooth aches, or you chipped a tooth, it’s important to have a complete exam so you are aware of what is going on. We will do our best to make your emergency visit easy and painless. It’s always better to take care of a dental problem early, before it becomes worse. We encourage you to be on top of your dental care, because your mouth and entire body are connected. When there is a dental infection in your mouth, it can often affect the rest of your body. If you’re looking for that perfect movie-star smile, dental veneers and porcelain crowns are the best option. Whether your teeth are stained, misshaped, chipped, or not aligned perfectly, veneers and crowns can give you the confidence to smile again. Our cosmetic dentists will give you a thorough examination to assess your bite, gums and current smile. We will see what options are best for you so that you have the best outcome possible. Unlike conventional metal braces, Invisalign is the clear and easy way to straighten your teeth. 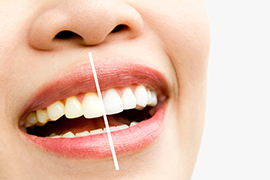 Invisalign trays are much more discreet than conventional metal braces. They are very effective in fixing teeth that are crowded or not correctly positioned. Invisalign is very easy to do and painless. We are Invisalign providers, which means we work hand-in-hand with Invisalign to get you the best results possible. Zoom teeth whitening is the standard of care when it comes to in-office teeth whitening. Unlike other brands or techniques, Zoom is the most trusted in-office whitening brand by dentists. In one appointment your teeth can become shades whiter. 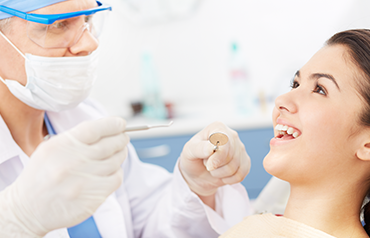 Sedation is a great option for patients who don't want to feel a thing during their dental procedures. Our specialists are certified to safely sedate and treat our patients so that your visit is easy. Whether you need your wisdom teeth removed, or require a dental implant, our expert doctors will make sure you will have the best possible outcome. Clenching and grinding can cause a lot of excess wear and damage to your teeth. This extra pressure may result in sensitivity, chipped teeth, or jaw and tooth pain. A night guard will protect your teeth by absorbing this pressure. 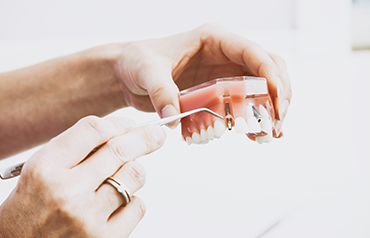 If your current complete denture doesn't fit well or moves around, implant over dentures can give you the stability you need. A conventional complete denture only sits on the gums and has nothing to hold it in place. Implant over dentures clip into implants, so that they stay in firmly. This increased retention will improve your day-to-day life by giving you more confidence and allowing you to eat better.